Plan of New York etc. This is a beautiful example of S. A. Mitchell Junior's 1866 map of New York City. 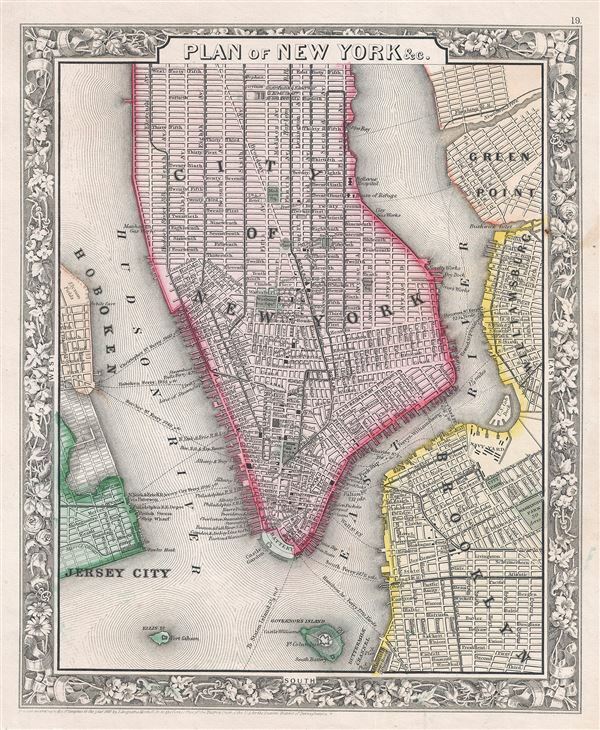 The map depicts southern Manhattan, below 45th street, along with parts of Brooklyn, Williamsburg, Greenpoint, Hoboken, and Jersey City. Mitchell offers wonderful detail at the street level including references to parks, individual streets, piers, ferries, and important buildings. Color coded with red, green, and yellow pastels according to political divisions. The whole is surrounded by the attractive floral border common to Mitchell atlases between 1860 and 1866. Very good. Minor spotting. Blank on verso. Rumsey 0565.010. Phillips (Atlases) 831-16. New York Public Library, Map Division, Digital ID: 1510801. Haskell, D., Manhattan Maps: A Co-operative List, 1104 & 1105.